Gwinnett county is a large and diverse place, requiring a wide range of solutions to its problems. More so now than ever, a full suite of transportation technologies are available to us here in the metro, ranging from Heavy Rail and Express Buses to Community Circulators and Bus Rapid Transt, which can be implemented as needed for a comprehensive approach to transit. The plan for Gwinnett is not only that of increasing mobility within the county itself, but also increasing mobility to some of the region's largest employment centers by taking full advantage of these technologies. 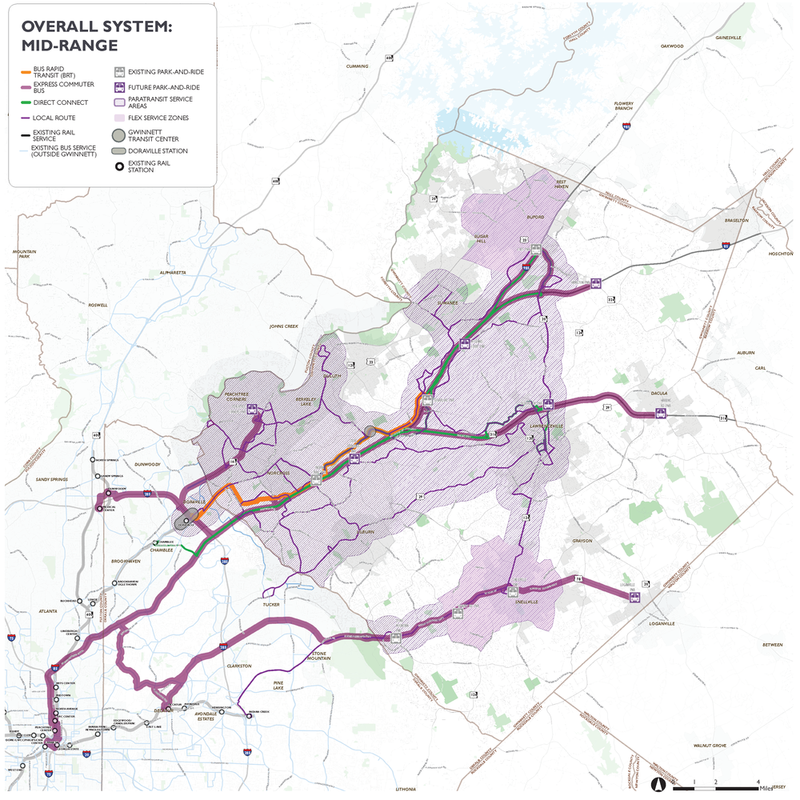 This plan would offers a web of Bus Rapid Transit, Arterial Rapid Transit, Frequent Buses, Local Buses, Flex Service, Direct Connect, and Express Buses throughout the county, building off an anchor of Heavy Rail Transit from the core of Atlanta. The Short-Range Plan has been defined to reflect service plan proposals for the first five years of the Plan (FY 2019-2024). Short-Range recommendations are based on most immediate service needs (e.g., reduction in circuitous routing, later evening service), and take into consideration existing infrastructure/fleet constraints and the likely time-frames required to implement significant capital improvements. The proposed Short-Range Plan reflects a significant expansion of service over existing Gwinnett County Transit service—a 125 percent increase in annual bus-hours of service. The Short-Range plan offers both new routes, as well as modifications to existing routes for local bus services. Express buses would continue, and even be expanded with a new route to Lawrenceville. New flex services would provide service to the Buford/Sugar Hill, and Snellville areas. Direct Connect services are a new type of transit service for Gwinnett County, providing an all-day, bi-directional connection to MARTA rail service (specifically to the Chamblee Station in the FY2019-24 horizon). Limited stops are proposed, to achieve a competitive travel time, similar to Express Commuter service. This service would be branded as a premium service. A set of new transit hubs and Park-n-Ride facilities would be built to complement these routes, while existing facilities would receive upgrades. Additionally, system-wide improvements such as bus stop upgrades, new technology integration, vanpool options, and fleet modernization would all complement the reworked network. The Mid-Range Plan (FY 2025-2029) reflects potential service for Gwinnett County that could be implemented within the next 10 years. The transit services and capital improvements in the Mid-Range Plan include improvements that require more investment or a longer time-frame than would be allowed in the Short-Range. The Mid-Range Plan includes introduction of the first BRT service in Gwinnett County. This proposed BRT line would begin at the Doraville MARTA station, where additional bus bay capacity will be provided to accommodate the service, and then work its way to the Sugarloaf Mills Park-n-Ride. A substantial portion of the alignment is proposed to be dedicated lanes, beginning north of Jimmy Carter Boulevard. It will serve 22 stations spaced approximately every half-mile along the route. Local routes will be adjusted to compliment the new BRT route, and generally expand service further, particularly into DeKalb County. A new set of local routes will also expand the reach of Gwinnett’s transit system, further filling in gaps. New express routes woudld add even more connections to Perimeter Center and Emory, as well as the existing MARTA rail system. New Park-n-Ride facilities would open to incorporate these new commuter bus routes and the expanding overall network. The Long-Range Plan Phase 1A builds on the Mid-Range Plan with substantial investments in several of the higher-demand corridors. The proposed Plan looks at ways to invest in travel time, reliability, and capacity improvements in the higher-demand corridors while growing overall coverage of the County through appropriate levels of investment by area. The Long-Range Plan Phase 1A Plan proposes extending MARTA’s Gold Line heavy rail service into Gwinnett, up to Jimmy Carter Blvd, with the existing Bus Rapid Transit route adjusted to realign with the new terminal. Two brand new BRT routes would be built from existing bus routes, and will include exclusive bus lanes along significant portions of the alignments to allow the buses to bypass congestion. Additionally, six new Arterial Rapid Transit (Rapid Bus) routes would be built, some based off of existing bus routes, including limited bus lanes, signal priority, and que-jump lanes. Local, Direct, and Express bus routes will be adjusted to compliment the new BRT and ART routes. A new direct bus route will begin operation. New Flex Routes will begin operation in the Suwanee, Lawrecneville, Dacula, Loganville, and Hamilton Mill areas. Fiscal years 2040 through 2048 represent the second half of the Long-Range portion of this Plan, designated as Long-Range 1B. While most of the Long-Range improvements envisioned in this Plan are implemented in the previous Long-Range 1A time-frame (FY 2030-2039), the improvements in the 1B time-frame represent long-term investments in larger projects. There are no modifications proposed to any bus routes in Long-Range Phase 1B. The bus route configuration shown in Long-Range Phase 1A would carry forward through Long-Range Phase 1B. Proposed improvements in this section would be implemented after FY 2048. Since the time-frame of the projects in this section are beyond the 30-year financial scope of this Plan, this section represents a set of improvements that are desired but are not financially constrained. Further financial planning will be needed to implement the projects outlined within this section. Convert BRT Route 700 to LRT. Additionally, the Phase 2 Plan includes conversion of two Rapid routes from the Long-Range Plan 1A/1B into BRT routes.